Unlike most podcasts which usually feature one to two main hosts speaking on a specific topic with featured guests and music, We’re Alive is a whole new breed of podcast. The format is much like older radio dramas, with characters and scenes and sound effects, oh my! But the real hook is something that has been gaining popularity in our culture for years: Zombies! Listeners listen as a group of everyday people struggle to survive in Los Angeles as the city, and the country, is overrun with flesh eating corpses. As the creator, writer, and producer of We’re Alive, Kc Wayland uses not only his background in animation and film making but his experiences as a soldier overseas to make the world come alive in his podcast. Each and every character is multi-faceted, deep and integral to the plot, even if it isn’t clear how just yet. If that wasn’t enough, the quality of the production is beyond anything else that you’re likely to find out there. Listening puts you right into the action. Into every argument, every gun fight and every quiet moment. 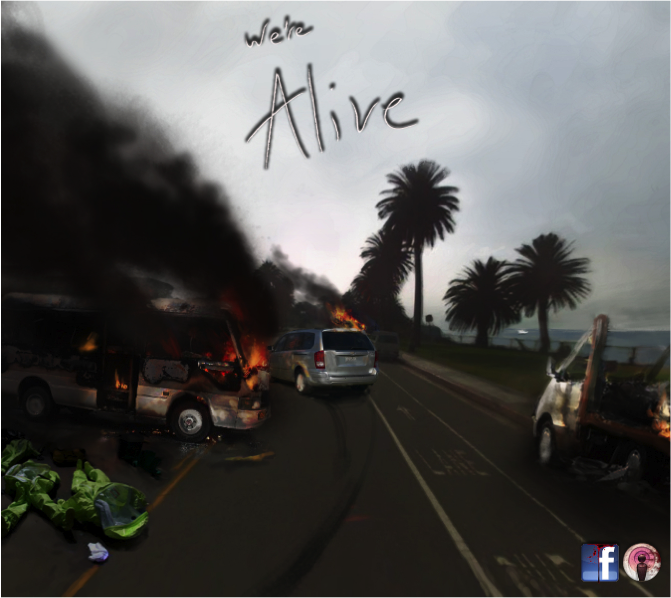 Every episode is about twenty minutes in length, and all are available for free on iTunes, Zune, Feedburner, and on the We’re Alive website itself, which is easy to remember as simply http://www.zombiepodcast.com. Go now and immerse your ears into the gory, gritty, human story that has started its fourth and final season. Two Mondays every month and you’ll be hooked, I promise! ← Who’s the Good Guy Now?